We’d love your help. 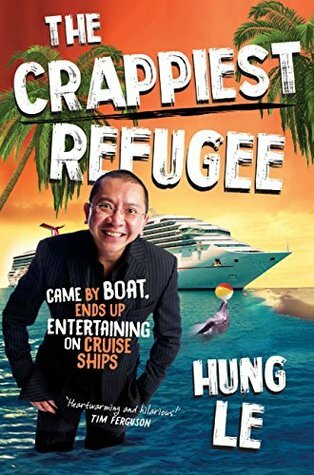 Let us know what’s wrong with this preview of The Crappiest Refugee by Hung Le. Defying the stereotype, Hung wasn’t a math or computer whizz, he ha On the last day of the Vietnam War, nine-year-old Hung jumped on a leaking prawn trawler on the Saigon River, somehow cheating death to become one of the first Vietnamese boat people to arrive Australia, a land where a young man’s potential is limited only by his imagination – that is unless you’re Hung Le. To ask other readers questions about The Crappiest Refugee, please sign up. To be honest, I’ve not heard of the author before. The reason I chose to read this book was because of the blurb. It made me laugh. In fact, nearly all of the book did. I say ‘nearly’ because there were parts that made me pretty uncomfortable - the animal cruelty and the drug abuse. He mentions using crack in a very glib manner and only briefly before moving onto his next topic of merriment. I did a double take. Yep. Crack. O-Kay. I did like his parts about his father. The affection he had for hi To be honest, I’ve not heard of the author before. The reason I chose to read this book was because of the blurb. It made me laugh. In fact, nearly all of the book did. I say ‘nearly’ because there were parts that made me pretty uncomfortable - the animal cruelty and the drug abuse. He mentions using crack in a very glib manner and only briefly before moving onto his next topic of merriment. I did a double take. Yep. Crack. O-Kay. I did like his parts about his father. The affection he had for him really stands out in this book, along with his respect for his artistic talent. Hung Le used to sometimes appear on TV in the 1990s making jokes about Banh Mi Pork Rolls. In his memoir he sets out to explain to readers why he is "the crappiest refugee" rather than the happiest. One thing apparently being the first Asian to be kicked out Melbourne Uni. An interesting read overall, if you are a fan of dark Aussie immigrant humour. This book was hilarious! I hadn't heard about Hung Le before, but I really enjoyed his look back on his life and his self-depricating sense of humour.